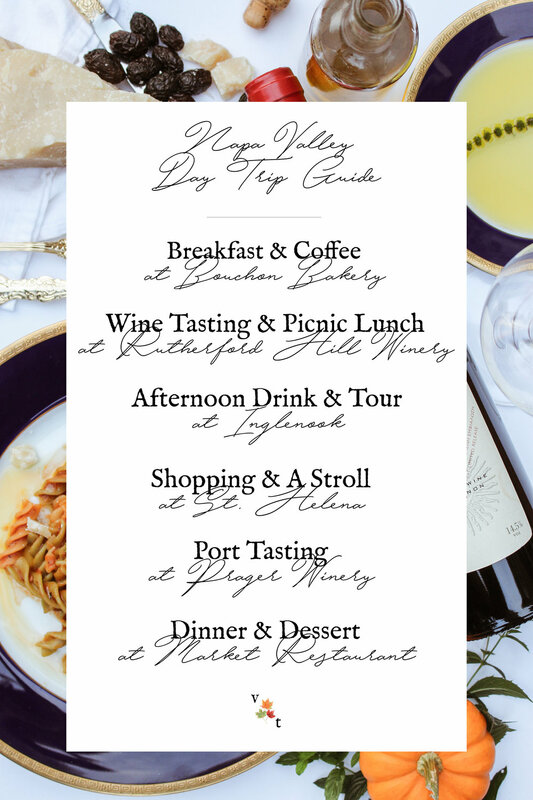 Date Day: The Best of Napa (& My Guide for Day Trip!) — Victoria, Truthfully. While reading, listen to Breezin' Along With The Breeze by Josephine Baker. Napa Valley is one of the top reasons why I love California. California is filled to the brim with gorgeous landscapes, mountains, beaches, and forests. Though Reed and I love to camp, swim in the ocean, and hike scenic trails...we also love a good glass of wine. Napa Valley's beauty is the perfect hybrid of nature's abundance and man's toil. Each year around harvest season, I am thrilled to see the fruits of each winery's labor...glistening purple and green grapes under the warm Napa sun. Napa provides the perfect getaway for wine lovers, and foodies alike - offering countless opportunities for beautiful sights, smells, and tastes. For those who live in the Bay Area, Napa is truly like glimpsing into your Bordeaux or Tuscany daydreams. Reed and I are blessed to frequent wine country because of my parents - the original wine and food connoisseurs. My parents are very passionate about food, hospitality, and enjoying life. They leave their special, loving touch on each person they meet, and they always carry with them, a warm, and engaging attitude. Kindness begets kindness, and we are often rewarded with an extra pour or two because of how awesome they are. We are lucky to learn from them. They are also wine club members at several wineries throughout Napa Valley, and are often generous enough to take us along for tastings. Since moving to the Bay Area, this has quickly become one of our favorite things to do together. On Saturday, with special friends in town for a weekend visit, we planned an exciting and full Napa day-trip! Though it was only one day, (Reed and I would love to spend a whole week out there someday), it was truly enough to have several wonderful experiences together. If you are looking to take a trip out to Napa, there are hundreds of things you could do and thoroughly enjoy. I am by no means a Napa expert nor as educated a wine enthusiast as some, but I do have my favorite spots! Here is my little guide to the perfect Napa Day. For more information on the places mentioned in my guide, click below. I hope that you get a chance to spend some time in Napa Valley, California soon, and enjoy all of its gorgeous commodities. Below are some photos I snapped during our time together. What are your favorite places to visit in Napa? Feel free to share in the comments below!